In this blog post, I will provide evidence of what I believe is a stock market manipulation scheme involving InterOil (NYSE: IOC), John Thomas Financial, and Clarion Finanz AG. I believe that InterOil with the assistance of Clarion Finanz concealed John Thomas Financial’s involvement in helping it raise $95 million through a private placement of convertible debt securities. Clarion Finanz acted as a buffer between InterOil and John Thomas Financial to help InterOil hide John Thomas Financial's role in raising funds. Afterwards, InterOil filed false and misleading reports with the Securities and Exchange Commission in an effort to conceal John Thomas Financial’s role in helping the company raise $95 million in convertible debt. Carl Caserta, who in 1991 was barred by the Securities and Exchange Commission from “association with any broker, dealer, or investment advisor” played a role in helping InterOil use John Thomas Financial to obtain funds from investors. InterOil, John Thomas Financial, and Clarion Finanz concealed Caserta's role in helping the company raise $95 million in convertible debt. About a year later, John Thomas Financial helped InterOil improperly inflate the price of its common shares above $32.50 per share to force the conversion of debt to equity. 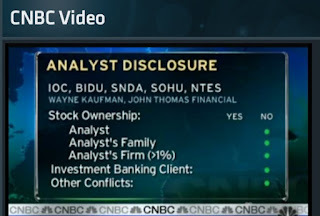 Wayne Kaufman from John Thomas Financial appeared on CNBC and called InterOil "Our favorite stock" and falsely disclosed that his company and InterOil had no prior business relationship. A couple of days later, John Thomas Financial issued a press release hyping Kaufman's CNBC appearance and his recommendation of InterOil and that press release also failed to disclose any prior relationship between the companies. Brokers from John Thomas Financial cold-called customers to get them to buy InterOil common shares and pump up the price of InterOil common shares. Right after John Thomas Financial started pumping InterOil shares to investors, without making conflict of interest disclosures, InterOil common shares traded over $32.50 per share for fifteen consecutive days, enabling the company to force the conversion of all convertible debt to equity. Clarion Finanz is a major shareholder of InterOil and the value of its stock holdings rose as a result of the illegal scheme. My conclusions are based on a two month investigation by convicted felon turned fraud fighter and short seller Barry Minkow (co-founder of the Fraud Discovery Institute) with additional research assistance from me. Evidence of the stock market manipulation scheme was pieced together from InterOil filings with the Securities and Exchange Commission. I compared InterOil financial disclosures with Court filings and affidavits involving a lawsuit brought by William Ziegler against John Dolan and two of his entities (Carey International Ltd and John Thomas Structured Finance - unrelated to John Thomas Financial above). Dolan had assisted InterOil in raising funds for the $95 million convertible debenture private placement and raised $20 million from Ziegler. However, Ziegler's lawsuit claims that he is owed certain fees from Dolan and his companies. Note: Download lawsuit here, download exhibits here, download John Dolan affidavit here, download Thomas Belesis (John Thomas Financial) affidavit here, and download Neil Dolinsky (InterOil Affidavit) here. In addition, I obtained certain documentation from reliable sources that confirms my belief of a stock market manipulation scheme between InterOil, Clarion Finanz, and John Thomas Financial. That documentation was delivered by me to securities regulators. Details of the scheme are below. On May 3, 2006, InterOil entered into a two year $130 million loan agreement with Merrill Lynch Capital Corporation and Clarion Finanz. Merrill Lynch provided InterOil with $70 million and Clarion Finanz provided the company with $60 million under the said loan. By March 31, 2008, InterOil had drawn down all of the funds under the loan agreement and lacked enough funds to pay back the $130 million loan. On May 1, 2008, InterOil extended the loan maturity date to May 12. (See Page 10, Note 3). On May 6, 2008, Clarion Finanz converted its $60 million share of the $130 million loan to 2,649,007 shares of common stock, including 79,470 shares issued as a fee, based on a price of $22.65 per share (See Annual Information Form Page 45 and 46). InterOil required a $95 million cash infusion to pay back $70 million of debt still due to Merrill Lynch by May 12. In addition, the company needed to raise an additional $25 million of working capital to fund its operations. As of March 31, 2009, InterOil reported working capital of only $61.2 million and paying back such debt would have wiped out its working capital (See Consolidated Balance Sheet). The company prepared to raise that $95 million through a private placement of convertible debt securities. Reliable information received by me and passed on to securities regulators, shows that InterOil initially sought the help of John Thomas Financial, who in turn brought in Carey International to assist the company in raising funds. According to court documents filed in the Ziegler lawsuit, John Thomas Financial received a "royalty fee" or finder's fee from Carey International. Other documentation shows that InterOil CEO Phil Mulacek's brother Pierre Mulacek, President of Arkanova (OTC BB: AKVA.OB) had a previous investment banking relationship in March 2008 with John Thomas Financial when Arkanova paid a finder's $40,000 fee to John Thomas Financial. Pierre Mulacek is a founding shareholder of InterOil. InterOil chose to hide the role of Carey International and John Thomas Financial in helping the company raise $95 million for its private placement convertible debt offering. Initially InterOil was dealing directly with Carey International and John Thomas Financial. Later, InterOil used Clarion Finanz, headed by Carlo Civelli, as a buffer between InterOil on one side and Carey International and John Thomas Financial on the other side of the transaction. According to the New York Times, "InterOil has obtained millions of dollars in loans from Clarion Finanz AG, the investment firm of Carlo Civelli, a Swiss businessman who has worked with Mr. Mulacek since 1996 as an investor or adviser." Carey International and its principal John Dolan did not know that they were being used as buffer as part of a stock market manipulation scheme. Other information obtained by me and passed on to securities regulators show that Carl Caserta played a role in helping the InterOil with the assistance of John Thomas Financial raise $95 million in convertible debt. In 1991, Caserta was barred by the Securities and Exchange Commission from “association with any broker, dealer, or investment advisor." In a previous blog post, I detailed how in New York Times in 2007 reported that, Caserta "stopped working for InterOil" in 2005. According to the article, InterOil claimed that it "was not aware of Mr. Caserta's history when he was retained." However, an investigation by Fraud Discovery Institute co-founder Barry Minkow revealed that Caserta retained an active email address at InterOil up to the day of my blog post. IOC issued to Clarion 228,000 restricted shares of its common stock as a finders fee, valued at $25 per share, equating to a total value of $5.7 million. (Source: InterOil Special Projects Manager Neil Dolinsky affidavit from Zeigler v Dolan et al). On April 24, 2008, Clarion Finanz entered into a separate Investment Banking Consulting Agreement with Carey International for its role in helping Clarion Finanz raise funds for InterOil. The agreement called for Carey International to "receive compensation in the amount equal to five and one half percent (5 1/2%) of gross proceeds...." of funds it helped Clarion Finanz raise on behalf of InterOil. In addition, the agreement stated that "Carey International Ltd and/or assigns will pay a royalty fee of approximately 20% to John Thomas Financial and/or assigns." Court documents show that Carey International received 44,000 of the 228,000 restricted common shares due to Clarion Finanz from InterOil. Those shares were issued directly from InterOil to Carey International and John Thomas Financial instead of being paid to them directly by Clarion Finanz. Carey International’s convertible debt shares were valued at $25 per share (total value of $1.1 million or 5.5% of the $20 million raised by Carey). From those 44,000 restricted common shares due Carey International, John Thomas Financial received 20% of such shares as a "royalty fee" or 8,800 restricted common shares valued at $25 per share or $220,000. May 12, 2008 — InterOil Corporation (IOL:TSX)(IOC:AMEX) (IOC:POMSoX), a Canadian company with operations in Papua New Guinea, announced that it has closed on gross proceeds of US$95 million from the sale to institutional investors of 8% Subordinated Convertible Debentures due 2013. InterOil used the proceeds today to fully repay all outstanding indebtedness (US$70 million) under its credit facility with Merrill Lynch Capital Corporation. InterOil will use any remaining proceeds to drill and develop oil and gas wells on the Elk/Antelope structures in Papua New Guinea and for general corporate purposes. The Convertible Subordinated Debentures carry an 8% coupon rate with a conversion price of US$25.00 per share. In some cases, interest payments may be made in common shares. If the daily volume-weighted average price of the Company’s common shares equals or exceeds US$32.50 for at least 15 consecutive trading days, InterOil may require the investors to convert the debentures into common shares. InterOil may also be required to repurchase the debentures for cash, at 101% of the face value plus accrued and unpaid interest, upon the occurrence of certain change of control events. The $5.7 million finder’s fee payable to Clarion Finanz was not disclosed in Interoil’s press release detailed above. On May 28, 2008, InterOil filed Form D with the Securities and Exchange Commission which required the company to disclose sales commissions and finder's fees paid in connection with the $95 million convertible debt offering (See Section C, Item 4 on page 5 of 10). InterOil estimated that no sales commissions or finder's fees would be paid in connection with the offering. However, Court documents show that InterOil had prior knowledge that such commissions or finder's fees were paid despite the company's failure to disclose them in its May 12 press release and May 28 Form D filing with the SEC. According to an affidavit filed by Neil Dolinsky (InterOil Special Projects Manager) in connection with Ziegler's lawsuit against Dolan and his companies, InterOil agreed to pay Clarion $5.7 million in convertible securities for its role in helping the company raise $95 million in its private placement of convertible securities and that “IOC issued to Clarion 228,000 restricted shares of its common stock as a finders fee, valued at $25 per share, equating to a total value of $5.7 million." In addition, InterOil knew of the separate agreement entered into between Clarion Finanz and Carey International before its press release and SEC Form D filing. According to that agreement, Carey International was required to pay a "royalty fee" or finder's fee to John Thomas Financial. However, $1.1 million of such fees were not paid to "investors" as claimed by InterOil and was instead paid directly to Carey International and John Thomas Financial. Neither John Dolan nor Carey International invested any money in InterOil and therefore, such fees cannot possibly be a part of the $5,700,000 paid to “investors.” Yet, that is exactly where Mr. Dolan’s 44,000 shares, valued at $1.1 million, came from. Ultimately, Carey's shares were divided up into 35,200 shares made payable to Cary International (John Dolan’s group) and 8,800 shares John Thomas Financial (as a royalty fee). Interoil’s “Annual Report Form” lists various disclosures under the caption, “Material Contracts.” However, InterOil omitted any disclosure relating to Clarion's roles in the $95 million private placement while disclosing Clarion's role in other transactions. Apparently, there was a very good reason to hide any direct role by John Thomas Financial in raising $95 million of convertible debt. As I will detail below, John Thomas Financial orchestrated a public campaign to hype InterOil stock, without disclosing to investors its conflict of interest from helping InterOil raise convertible debt. Our favorite stock is something called InterOil which I recommended on the air before. Note: Above quote appears 3 minutes and 55 seconds into video clip. 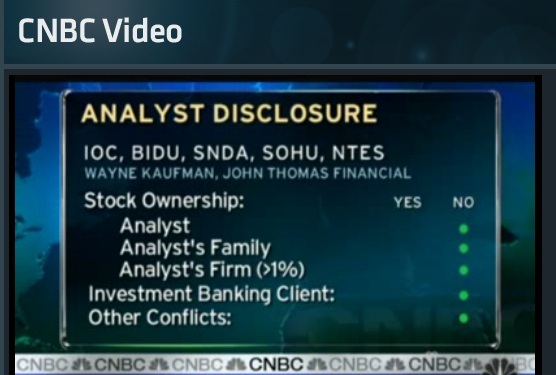 Worst yet, 4 minutes and 6 seconds into the video clip, CNBC shows a screen called "Analyst Disclosure" that checks off the following items as "no." Contrary to the disclosure above on CNBC that John Thomas Financial had no investment banking relationship with InterOil, such relationship was cleverly hidden by InterOil using Clarion Finanz AZ as a buffer to raise $95 million for its private placement and have Clarion deal with John Thomas Finance through Carey International. After Wayne Kaufman’s appearance on CNBC, InterOil common stock closed at $30.39 per share, up $1.14 from the previous day. On April 30, 2009, InterOil common stock closed at $32.29 per share, up $1.90 from the previous day. Brokers from John Thomas Financial were cold calling investors to buy InterOil stock and price of InterOil shares continued to rise. On May 1, 2009, John Thomas Financial issued a press release touting Wayne Kaufman’s CNBC appearance and featuring his InterOil recommendation without disclosing their broker/dealer relationship with InterOil that was cleverly disguised by false SEC filings as detailed above. May 01, 2009 14:57 ETSell in May? CNBC Once Again Features Wayne Kaufman, CMT at John Thomas Financial, Inc. NEW YORK, NY--(Marketwire - May 1, 2009) - John Thomas Financial, Inc., a licensed, full service broker dealer offering client-centric retail brokerage and investment banking services, today announced that Wayne S. Kaufman, CMT and Chief Market Analyst at John Thomas Financial was a featured analyst on CNBC from the floor of the New York Stock Exchange debating whether the "sell in May" indicator will hold true this year, with Jeffrey Hirsch, Wayne Kaufman and CNBC's Rebecca Jarvis. When asked if this market will keep going, Kaufman remarked that he sees "Nothing that says we can't keep going up. Sellers don't seem to be around and Governments around the world are pumping money into the market. I am looking for a continuation of stocks that have been strong in the tech and energy areas such as Interoil Corp, Symbol IOC on the NYSE." Thomas Belesis, Founder and CEO of John Thomas Financial, commented, "When the public needs great information they call on the years of experience, technical and analytical skills of Mr. Kaufman." Kaufman authors the popular daily market letter, "The Kaufman Report," which includes technical and fundamental analysis of the U.S. equities markets, general investment philosophies and reviews of prevailing political, economic and business trends that are impacting the financial markets. With over 10 years experience as a technical and fundamental market analyst with several Wall Street firms, Kaufman has been widely quoted in the financial media, including CNBC, Bloomberg Radio, Barron's and the Wall Street Journal. Holding the designation of Chartered Market Technician (CMT) and a licensed Research Analyst, Kaufman has served as an online instructor teaching CMT candidates "Level 3" coursework for the Market Technicians Associations (MTA), the leading national organization of technical analysts in the United States. The MTA's CMT program is considered the industry's gold standard in technical analysis. Kaufman graduated from the University of Michigan where he earned a Bachelors degree in Liberal Arts. About John Thomas Financial, Inc.
John Thomas Financial, member of the FINRA and SIPC, is an independent broker dealer and investment banking firm headquartered in New York City's Wall Street district, with a growing network of branch offices throughout the country. Emphasizing a client-centric approach to managing all aspects of its business, the firm offers a full complement of retail brokerage and corporate advisory services tailored to the unique needs of its clients. For more information on the firm, please visit http://www.johnthomasbd.com/ or contact our strategic business development center below. [Emphasis added.]. Information obtained by me and turned over to securities regulators clearly shows that John Thomas Financial's compliance personnel knew from April 2008 about the prior business relationship with InterOil, but they apparently did nothing to disclose the conflict of interest with CNBC or in the above press release. As described above, John Thomas Financial's relationship with InterOil was subsequently papered over to use Clarion Finanz as a buffer between InterOil and John Thomas Financial. On May 1, 2009, InterOil common stock closed at $35.22, up $2.93 from the previous day. Starting on May 1, 2009 and for 14 consecutive trading days thereafter, InterOil common shares closed above $32.50 per share. InterOil common stock continued to close at above $32.50 per share to May 21, 2009 (Source: NASDAQ). The Convertible Subordinated Debentures carry an 8% coupon rate with a conversion price of US$25.00 per share. In some cases, interest payments may be made in common shares. If the daily volume-weighted average price of the Company’s common shares equals or exceeds US$32.50 for at least 15 consecutive trading days, InterOil may require the investors to convert the debentures into common shares. On May 22, 2009, InterOil announced the forced conversion of the its convertible debentures to equity, exactly 15 trading days after John Thomas Financial issued a press release touting Wayne Kaufman’s appearance on CNBC where he called InterOil, “Our favorite stock” without disclosing any prior relationships between the companies. Meanwhile, Clarion Finanz received about 2.6 million shares on May 6, 2008 from converting its $60 million loan to common stock valued at $22.65 per share. In addition, Clarion received a net amount of 184,000 restricted common shares valued at $25 per share for its role in helping InterOil raise $95 million in convertible debt on May 12, 2008. By May 21, 2009, Clarion Finanz's common shares were valued at $36.23 per share. For other details of Fraud Discovery Institute's investigation of InterOil, please visit InterNoOil.com. I am assisting Barry Minkow and Fraud Discovery Institute in researching InterOil and Minkow has a short position in InterOil. I have no position in InterOil securities, long or short.